Want Free Bacon? 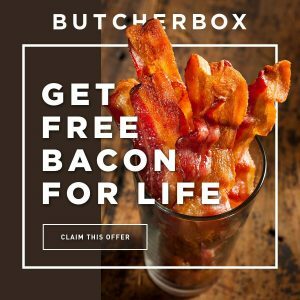 Free Bacon For LIFE from Butcherbox! That’s right, today (Sunday June 10th) is the last day that all new customers placing their first order with butcherbox get a free package BACON in their order and in every order for the lifetime of their subscription! 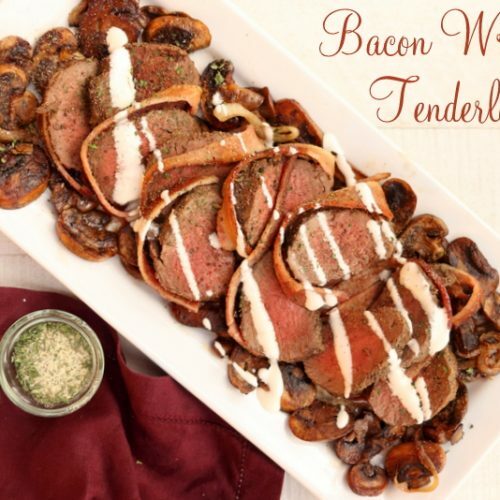 If you have never had tenderloin, you are in for a very juicy and soft steak! Tenderloin is a little tricky, if you over-cook it or usually like your steaks medium or well done, you most likely will end up with a chewy loin. I highly suggest making tenderloin rare to medium rare. My kids were a little afraid of the pink at first but once they took their first bite, they smiled and gobbled it up! Preheat oven to 425 degrees F. Place bacon on a slotted baking sheet with edges, laying them next to each other with edges lining up. 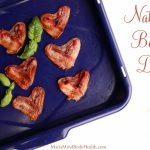 Bake bacon in the preheated oven until partially cooked but still flexible, about 6 minutes. 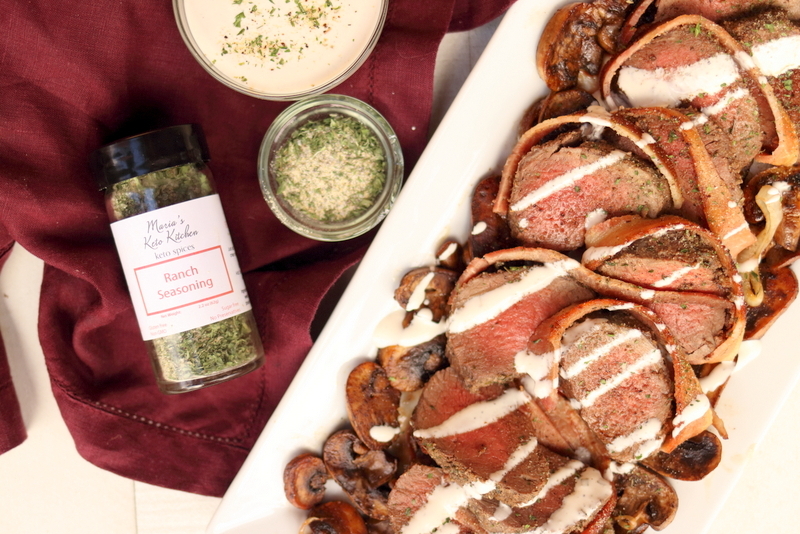 Brush venison tenderloin with 1 teaspoon melted butter or oil and season with 1½ tablespoon ranch seasoning. 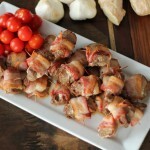 Place tenderloin roast on one end of the strips of partially cooked bacon. Wrap bacon strips snugly around loin and place with the ends on bacon under the loin so the bacon secures around the loin. Bake for 15 minutes for medium rare loin. Remove from oven and allow to rest on cutting board for 10 minutes before slicing. 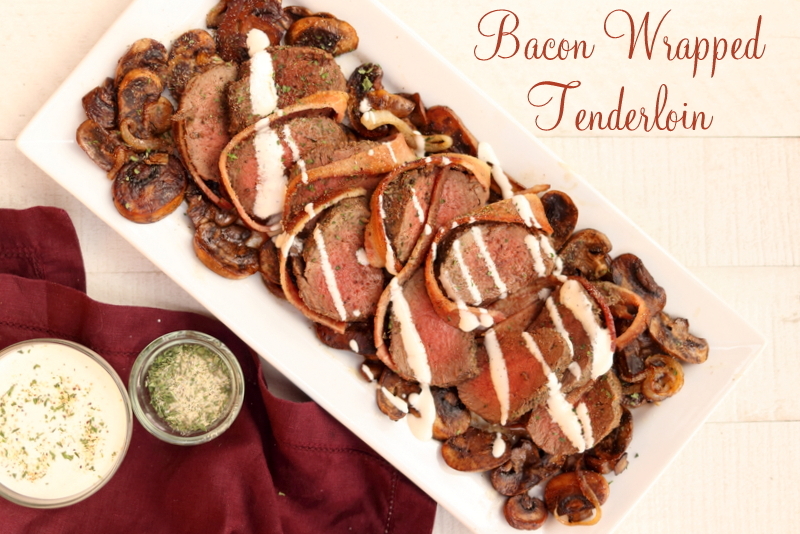 While the tenderloins bake make the mushrooms and ranch dressing. Place the rest of the butter in a large saute pan over medium heat. Add the mushrooms and onions and saute while stirring occasionally for 7 minutes, or until mushrooms are golden brown. Season with ½ teaspoon Ranch seasoning. 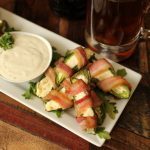 To make the Ranch dressing, place all the ingredients in a blender and puree until smooth. I store this tasty dressing in my fridge at all times. Place mushroom mixture on a serving platter. Slice the loin into ½ inch slices and place onto the platter. Drizzle with Ranch dressing if desired. 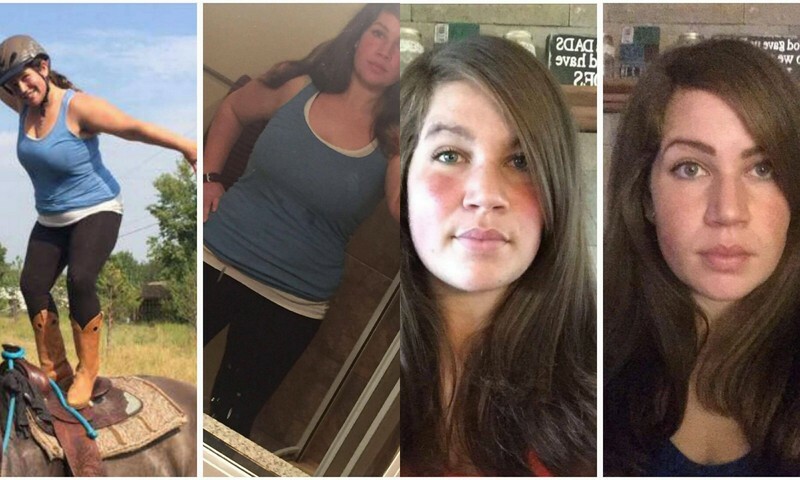 The 30 Day Ketogenic Cleanse Testimony: “30 day cleanse result! Full body pic on left was taken in August right taken today. . Face pic left take week before cleanse on right taken a week ago. I am actually blown away at my results! Got rid of 20.4 lbs I have energy all day long, the last 4 days I have been eating once a day and feeling great my two favourite transformations: I have no headache (suffered from a permanent headache day in day out) my mind is sharp! And I am sleeping (previous crazy active sleeper walker talker for all my life) like a log the alarm doesn’t even wake me up. I am also proud of the fact that I stuck it out I have never completed any sort of cleanse at all, this was enjoyable the food js amazing I don’t miss sugar/fruits/bread I wouldn’t mind trying dairy but I’m a lil scared too haha.